Hello there – I’m feeling very guilty as I write this as I should be just home from yoga, but when the alarm went off at 5:15am this morning I pulled the covers over my head and hid in bed instead. Consequently I am off to a 9:30am class (bad, bad, bad for my work-day flow!) and have been working since 7:30am instead. Anyhoo, I am taking ten minutes to quickly share this wee gem of a recipe with you, it’s one I put together for Fairfax so appearing in newspapers around the country and on Stuff today. 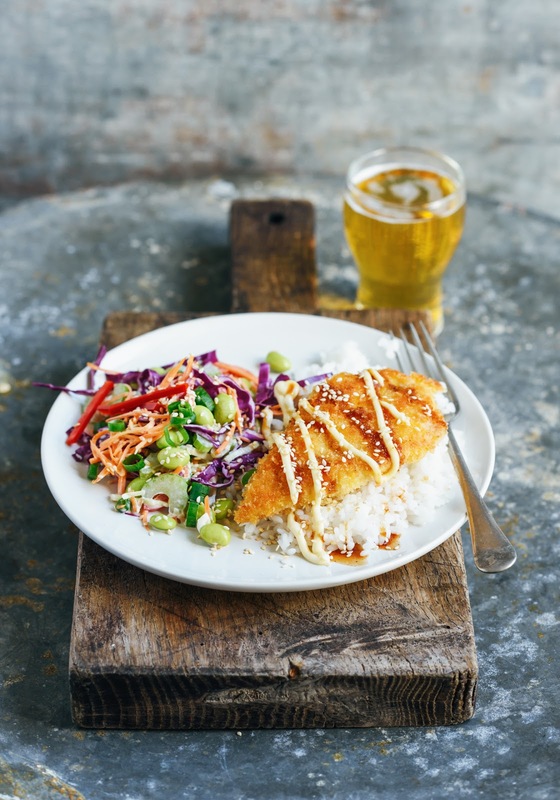 Basically it is my slightly lighter version of katsu chicken served on seasoned sushi rice, with a vibrant, flavour-packed Asian slaw on the side. To season about 2 1/2 cups (measured before cooking) of sushi rice I just whisk together 1/4 cup of rice vinegar, a tablespoon of caster sugar and about 1/2 teaspoon salt, then stir it through the rice once cooked, while still warm – it gives it a fabulous flavour boost. The slaw also makes a great lunch without the crumbed chicken, just add some flaked hot smoked salmon or cooked prawns for protein instead. Not much else to report at the mo, I had the world’s quietist weekend, and this week it’s (yoga aside) all business. Meanwhile Rich appeared on Te Radar on Saturday night looking gorgeous as ever (stand and deliver!) and had a fabulous time at Womad, while Henry and Will have secured an amazing flat in Melbourne – roll on moving day and Henry’s consequent miraculous apartment makeover. In not-so-good news Henry’s design course in Melbourne has been cancelled (long story), so he has the bloody conundrum of deciding what next having already completed two years of graphic design and one of interiors – blergh, poor darling, what a total pain! Katsu chicken recipe looks great! Thanks for sharing. I was able to find all the necessary ingredients, even those new to me, like Japanese Kewpie mayo. your efforts for your blog. It is definitely one of the best, Sarah! Icing sugar is powdered sugar, while caster sugar is superfine sugar. If it isn't available to buy you an just whiz regular sugar in a food processor 🙂 Hope this helps!